More than simply serving as America's "hostesses," many of the nation's First Ladies played vital roles in shaping their husband's presidency and serving as political activists in their own right. From Martha Washington to Michelle Obama, their inspiring stories come alive in this handsomely illustrated encyclopedia. 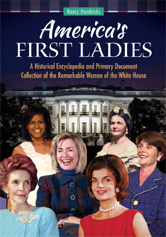 Within its pages, the First Ladies are revealed as human beings who, one day, awoke to find the eyes of the world upon them.